The colophon, adhered to the back of the clock, postulates that crickets, a symbol of good fortune, were often kept in cages so that their song could be enjoyed, a fate Dickinson might have considered related to the subjugation of women in her time. The only currently authenticated photograph of Dickinson, from the Amherst College Archives & Special Collections, was printed on clear film, the face back-painted and placed behind the glass door of the clock. An image of a cricket, merged with a map of Amherst in the early 1800’s showing Dickinson’s home, was printed on clear film and adhered to the clock’s brass pendulum. Originally written on the back of an envelope, Dickinson’s poem celebrates nature’s clock with the song of the cricket announcing the summer and its cessation heralding its end. The shape of the envelope echoes the shape of the clock steeple. I am a painter by training and collage-maker by nature who began to explore printing with early reprographic machines. Since being introduced to computers in the late 1960’s when working on my doctorate at Penn State, I have combined traditional and digital media. My work includes large scale mixed media pieces, artist books and book-like objects that bridge between these two forms. It embeds archetypal symbols and fragments of image and text in multiple layers of texture and meaning. It combines the humblest of materials, plaster, tar, wax and pigment, with the latest in technology to evoke the past and herald the future. My art-making is an integrated mode of inquiry that links concept and media in an ongoing dialogue – a visible means of exploring meaning. The book sculpture Esoteric Time began in 1914 with a 19th century New England steeple clock discovered while participating in a Guild of Bookworkers activity in Maine. The clock seemed an appropriate repository for one of Emily Dickinson’s untitled poems about time. Originally written on the back of an envelope, it celebrates nature’s clock with the song of the cricket announcing the summer and its cessation heralding its end. A symbol of good fortune, crickets were often kept in cages so that their song could be enjoyed, a fate Dickinson might have considered related to the subjugation of women in her time. 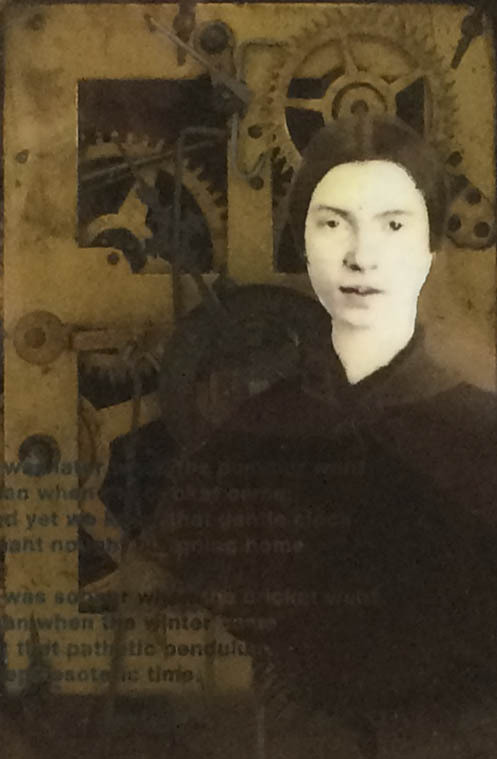 I removed the face of the clock and visually integrated the exposed gears with the text of the poem and the only currently authenticated photograph of Dickinson, (from the Amherst College Archives & Special Collections). The brass pendulum in the lower half of the clock reflects the cricket hovering over a map of Amherst showing Dickinson’s home in the early 1800’s. The colophon, adhered to the back of the clock includes a replica of the envelope with Dickinson’s handwritten poem.